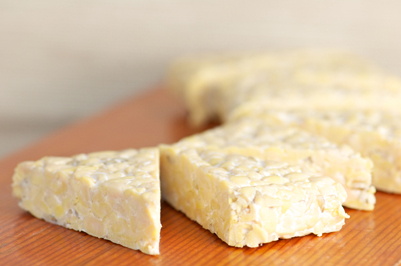 Tempeh is fermented soybeans molded into a cake that you can cut up into cubes or other entertaining shapes. It’s a great source of protein for people with IBS because it’s fermented, which means it’s easy to digest and doesn’t produce gas. The key to really good tempeh is all in the simmering sauce — it gives it a rich, meaty flavor. Make extra sauce and save it in the refrigerator for quick meal prep later, or use it in preparing beef for a stir fry. Frying the tempeh first creates a crunchier texture and keeps it from falling apart. This recipe was shared by Andrea Boje shared with us her favorite recipe for kabobs. Tempeh, originally from Indonesia, is very high in protein. Heat the oil in a frying pan over medium heat. Add the tempeh and cook until browned on each side (about 2 minutes per side), turning over with tongs. Pour the simmering sauce into the frying pan and simmer for about 8 minutes, turning the tempeh occasionally so that it soaks up the sauce evenly. Remove from heat. Put 4 to 5 tempeh cubes onto each skewer and place on a serving dish. Drizzle the remaining liquid from the pan over the skewers and serve. In a small bowl, mix the tamari, vinegar, rice syrup, ginger juice, and garlic until rice syrup has dissolved. Add 2 teaspoons of chopped lemongrass to the sauce for a Thai influence, or add 1/4 cup of pineapple or orange juice and 1/2 teaspoon of lemon zest to marinade for a tropical tang. Per serving: Calories 348; Fat 22.5 g (Saturated 3.7 g); Cholesterol 0 mg; Sodium 1351 mg; Carbohydrate 22.9 g (Fiber 0.3 g); Protein 18.1 g; Sugar 14.4 g.